Of course, as with so many new ventures, when it first became available to the public on May 8, 1886, Coca-Cola was a bit of a flop, averaging only about 9 glasses per day sold in the first year. This was despite the fact that it debuted at one of the most popular soda fountains in Atlanta, Georgia, located in Jacob’s Pharmacy. For reference here, their gross earnings on soda sales, according to the owner of the pharmacy, Dr. Joseph Jacobs, was about $150 per day (or about $4,100 today), of which Coca-Cola accounted for about 45 cents daily in the first year. And if the marketing and flavour didn’t work, their trump card was the fact that it contained coca leaf extract, a.k.a. cocaine, as well as lime juice which aids in cocaine absorption in the stomach for maximal bang for your buck on the drug element. Seemingly this should have seen it become a huge hit rather quickly, though it is noteworthy that various cocaine products were widely available at the time, so perhaps people didn’t have need to come back to Coca-Cola to get their fix. 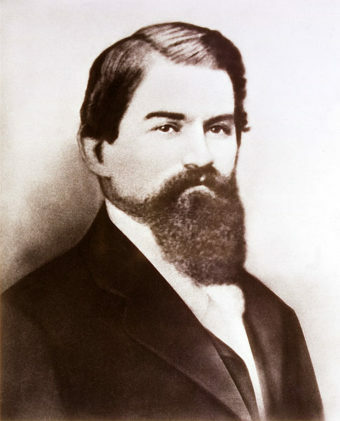 Whatever the case, as to how its inventor, pharmacist John Pemberton, came up with the tonic, he was specifically looking for a cure for his own morphine addiction. You see, Pemberton was a former Confederate soldier who nearly had his head lopped off in the Battle of Columbus. During his recovery from his wounds, as with so many others at the time, he became addicted to morphine and so was looking for something to wean him off the habit. Unfortunately for him, his initial concoction also included alcohol (from wine), which became banned in Atlanta where he lived in the same year he debuted his tonic, resulting in him substituting the wine with sugar and citric acid. He also, of course, mixed the whole thing with carbonated water, owing to, at the time, fizzy water being thought to be good for your health. Finally, in 1886 Pemberton was ready to start selling what would eventually become arguably the most famous non-water beverage brand on Earth. After a deal was struck with Dr. Joseph Jacobs of the aforementioned Jacobs’ Pharmacy and the soda fountain operator within, Willis Venable, Coca-Cola finally graced the world with its presence, selling for 5 cents per serving (about $1.38 today). Candler, after buying out the remaining shares, including from Pemberton, would start the process that turned the brand into the beverage powerhouse it is today, by 1919 himself selling the brand and recipe for a cool $25 million (about $361 million today) to a group of investors. As for Pemberton, when he sold his stake to Candler he did have a thought to leave a partial share to his son, Charles, in the hopes the morphine-addiction curing drink would someday become a huge hit. However, ultimately Charles and he opted to just take as much money as they could get at the time and forgo any further stake in Coca-Cola. Pemberton died shortly thereafter in poverty and his son Charles followed him about six years later, ironically dying of a morphine overdose. The name “Coca-Cola” was suggested by Pemberton’s bookkeeper, Frank Robinson, stemming from two of the key ingredients: extracts from the coca leaf and kola nut. Robinson was also the one to first pen the now classic cursive “Coca-Cola” logo. To fully replicate Coca-Cola, in the United States at least, you’d need something only one company has legal access to- unprocessed coca leaves. Currently, only Stepan Co. can import these leaves into the United States. They then process the leaves and sell the cocaine-free extract to Coca-Cola and the cocaine to the pharmaceutical company Mallinckrodt. Thus, to make your own Coca-Cola with the exact correct recipe, you’d need to convince Stepan Co. to branch out and sell to your company too. This is likely a tall order considering the pressure Coca-Cola would put on them not to.